FHL completed construction of a new 1500 sq. 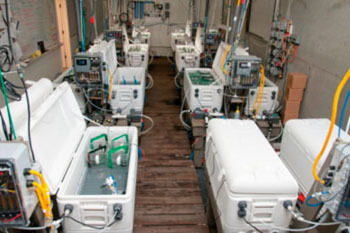 ft. experimental facility for ocean acidification research in summer 2011. 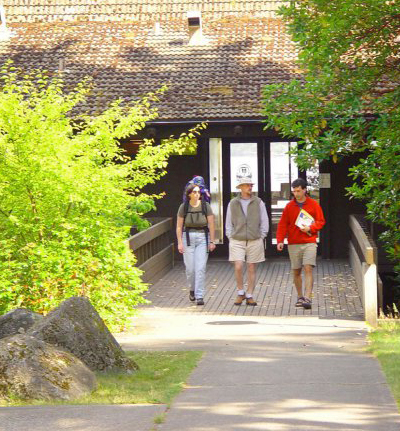 The facility was funded by an award from NSF’s Field Stations and Marine Laboratories (FSML) program, matching funds from the University of Washington, and private donors. The experimental facility currently includes an analytical chemistry laboratory, indoor mesocosms fed by a custom seawater-CO2 blending system and temperature control, and laboratory space. Led by Billie J. Swalla, OAEL Interim Manager (bjswalla@uw.edu), this state-of-the-art ocean acidification facility offers unique research and instructional opportunities for experimental manipulations with on-site monitoring of carbonate system parameters. Additionally, the analytical chemistry laboratory is available to run samples on a recharge basis. FHL’s location, facilities, and educational mission combine to make an ideal site for the experimental mesocosm and analytical facility. The analytical lab is equipped with equipment for analyses of all carbonate system parameters, as listed above. The pH is measured with the spectrophotometric technique described in SOP 6b (Dickson et al, 2007), using an Ocean Optics CCD spectrophotometer with temperature-controlled 10 cm path length cells. A custom-built, IR-based analyzer is used for total DIC of water samples. Total alkalinity is measured using an open cell titrator as outlined in SOP 3b. The lab also has a showerhead-equilibrator system for measuring pCO2, and a Haach conductivity meter for measuring sample salinity. It includes suitable chillers, balances and temperature probes for conducting measurements of the highest quality. An adjacent laboratory room has GCMS and LCMS instrumentation which could be used in conjunction with certain OA experiments. A general water chemistry laboratory is also available, in the Fernald laboratory building. The indoor mesocosm system provides experimental aquaria with independently controlled pH and temperature conditions, ideal for short term organismal studies. The lab is supplied with conditioned water from a custom filtration and CO2 stripping system supplied by the FHL seawater source. This produces water that has been filtered (0.2 µm), UV sterilized and stripped of CO2, to generally less than 300 µatm. Within the lab, manipulative experiments are conducted in custom designed mixing reservoirs (white Igloo coolers). Each mixing reservoir has a recirculating pump and venturi injector that constantly aerate the water with CO2-free air. The water is circulated through a chilling loop as well. Water chemistry is monitored by a Honeywell Durafet pH electrode in each reservoir connected to Honeywell UDA2182 process controller. This controller adds CO2 to the stream of CO2-free air to achieve the desired pH setpoint (range from ~8.2 to below 7.0) and a separate temperature controller activates a submersed heater to achieve the desired temperatures (range from ~8°C to 25°C). The lab currently has 16 experimental mixing reservoirs, each of which can hold eight experimental chambers. The 3.5 liter chambers sit within the mixed water to provide temperature control. The flow-through chambers (2-8 l per hour) are isolated from each other while sharing a common water source and temperature control. The lab also has a peristaltic pump system which can supply highly concentrated food to the experimental chambers. This provides even distribution of food, minimizes food effects on chamber chemistry, and ensures that food does not contaminate the mixing reservoir or neighboring chambers. The adjacent analytical chemistry laboratory provides capability for rapid monitoring of conditions within experimental reservoirs and chambers. We routinely verify the alkalinity of the incoming seawater, the total DIC of the mixing reservoirs and spectrophotometric pH of individual chambers. We welcome new users to the OAEL, from UW and off-campus. Fees for using the OAEL are scaled with respect to labor costs, UW affiliation or external users with no formal UW affiliation. Full service rates reflect technician time; self-service option is available to those experienced with carbonate chemistry measurements (a one-time training is required). All potential users of the OAEL must submit a brief research proposal for approval by the OAEL Research Committee. The intent of this proposal is to identify the suitability of the OAEL to support the research, the availability of the facility during the time period requested, and the fees associated with the research. Students should have the endorsement of the faculty supervisor. Proposals should be submitted well in advance (e.g., 3 – 4 months) of the intended start date to ensure cost-effective coordination among multiple concurrent projects. In addition to serving on-site researchers, the chemistry laboratory analyzes outside samples as workload permits. Generally we are very responsive to requests for rapid turn around. Contact the OAEL Interim Manager, Billie J. Swalla, for guidance on fee structure and the application process.